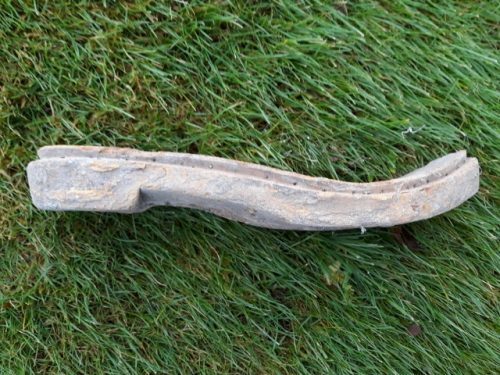 Found in debris at the Armitage Shanks site, Barrhead, Glasgow. This would probably have been work by one of the employees working within the factory. Clogs were used by many workers working in the various Scottish industries, including brickmaking and associated trades. A Clogger was a maker of clogs in Scotland. Scottish birch was one of the favoured woods for making clogs. Last century clogmaking became concentrated in the north of England and the south of Scotland. By the end of the century they were most popular in: Yorkshire, Lancashire, Cumbria, Northumberland and the south of Scotland. 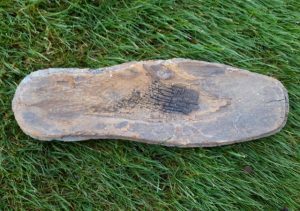 The photos of my clog show clearly the recess where the leather would be stitched or nailed to the sole. 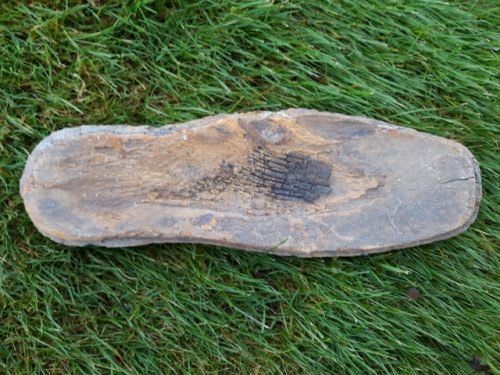 The sole its self has a line of nail holes around the edge where a narrow band of iron would have been fitted.